At the start of the 1980's, plans were already well underway for the celebration of the Tramway's centenary. Councillor Parkinson, the Chairman of the Transport Committee, suggested that trams from other towns and cities across the country should be used to attact visitors to the event. The first tram to arrive was Bolton 66 in 1981. Bolton 66 had recently been restored and remains in Blackpool to this day. The tram is an 8 wheeled standard double-decker built by the Electric Railway and Tramway Carriage Company in 1901. The tram was originally an open-topper but was enclosed in 1932 retaining open drivers platforms. 66 was renumbered 366 in 1940, surviving the Blitz and was withdrawn from service a year after the end of the War in 1946. The lower saloon was sold as a caravan and the upper deck was scrapped. 66 was rescued by local enthusiasts in 1964 and after the restoration which included the building of a completely new top deck built from wood salvaged from a Methodist Chapel that was being demolished and testing at Kearsley Power Station the tram arrived in Blackpool on 23 June 1981. Bolton 66 is still a firm favourite on the prom during the summer in particular and is a regular on the heritage tours and illuminations tours. Built in 1914 by the United Electric Car Company in Preston, Box Car 40 was one of a batch of 4 additional trams built for all year round use on the tramroad thus giving the tramroad 15 enclosed trams. 40 was a mainstay on the Fleetwood to North Station service until 1928 when the Pantograph Cars were introduced to the service. 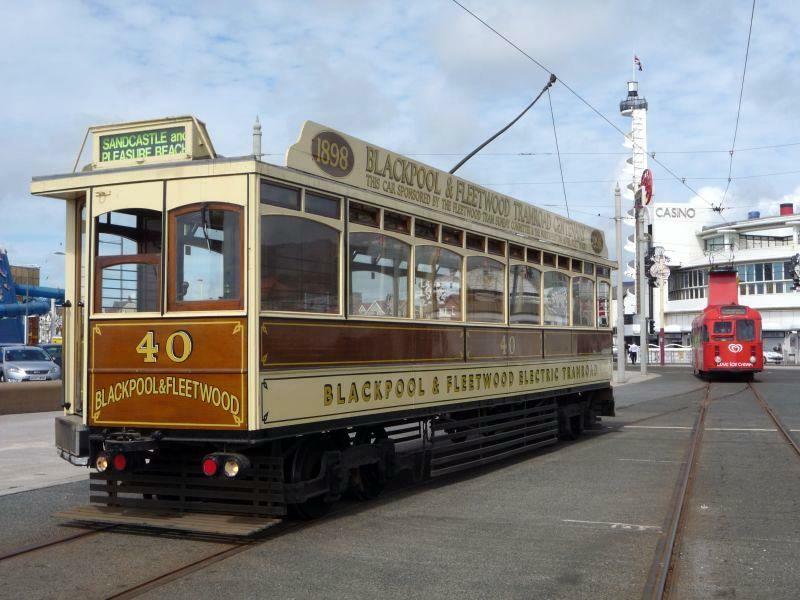 40 was renumbered to 114 in 1920 when the Tramroad was bought by Blackpool Corporation Transport. After 1928, 114 found use on the promenade and occasionally on services on the Lytham Road route. 114 was withdrawn in October 1937 (probably around the same time as the Brush Cars came into service) and found a new life as works car 5 and was used as a mess room and to transfer workmen to the trackwork sites. The tram continued in this role until 1960 when it was restored in time for the 75th anniversary of the tramway and regained it's original number (40). 40 then left for Crich in 1963, later moving to Heaton Park tramway and finally returning to Blackpool for seasonal use on specials in 1995. 40 has remained almost continuously with the exception of a return to Crich to celebrate its centenary in 2014. In 1924, Lytham St Annes Corporation were needing some new trams. They approached English Electric in Preston, who built 10 new balcony tram cars, numbered 41-50. The trams entered service in 1924 and remained in use until the system closed in 1937. Number 41 had survived the closure of the system, however it was scrapped by 1943. It later emerged that the lower saloon of 43 had survived. It was found in a farm and work began on restoring the saloon before it found its way to Rigby Road Depot in January 2016. Number 43 should eventually form part of a restoration project that will see the tram return to service at some point in the future. This will allow another piece of the tramways of the Fylde coast that isnt currently represented in the running fleet to feature in the future. 20 was built by G F Milnes (Birkenhead) in 1900 and ran in the town for 37 years. Originally built as an open topper, it received a wooden top deck In the 1920s. Following withdrawal in 1937, it was used as a potting shed near Chester. It was rescued in 1983 and restoration began in 1983, in a hangar at Speke Airport. Birkenhead 20 was returned to service in April 1999 at the Wirral Tramway, Birkenhead once again as an open topper. 20 joined the Heritage Fleet at Blackpool on loan in July 2017 for a year due to the lack of availability of an open top double decker in the current fleet.